In 2011, Wes Carter was talking to a handful of friends when he realized they had something in common: They all flew on the C-123 planes after the Vietnam War, and they were all sick. 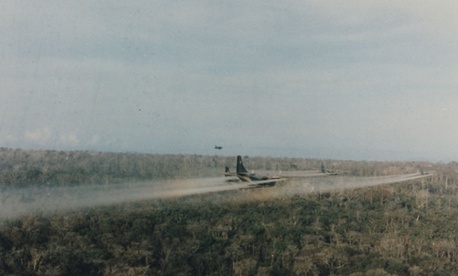 During the Vietnam War, C-123s were used to spray the herbicide Agent Orange. Although the planes were being used for cargo and medical flights by the time Carter served after the war, he and his fellow veterans believe their illnesses—which range from diabetes to cancer—are tied to their time on the planes between 1972 and 1982. "We were physically scraping goop from nooks and crannies trying to get the thing as clean as possible, because there's quite an odor to it," said Carter, 68, who flew on a C-123 plane and believes that his prostate cancer and heart disease are tied to his time in the service. So far, C-123 veterans have had little luck getting their disability claims granted. Last year, C-123 pilot Paul Bailey, who died in October 2013 after suffering from prostate cancer, became the first of Carter's group to get his exposure to Agent Orange recognized without having to seek help from the Board of Veterans Appeals. "I've said that because they've granted one, that becomes the de facto standard, why not grant them all?" said Thomas Bandzul, a lawyer representing the C-123 veterans. The Veterans Affairs Department said in a July 2013 letter to Bailey that the "preponderance of the evidence suggests that you were exposed to herbicide onboard the U.S. Air Force C-123K aircraft." But the claims are considered on a case-by-case basis, meaning the decision isn't factored in when VA staff look at other disability requests. The C-123 crew isn't the first group of veterans to accuse the VA of being unwilling to recognize that their illnesses are tied to Agent Orange exposure. For decades, veterans who served in the Vietnam War tried to get disability compensation, to no avail. It wasn't until almost 20 years after the war that the VA began to link certain illnesses in Vietnam veterans to Agent Orange. They are still pressing the department to cover more illnesses, with former Secretary Eric Shinseki in 2010 tying four more diseases to Agent Orange for Vietnam veterans. And, as before, the VA and the C-123 veterans each believe they have science on their side. The VA said in an email that any Agent Orange the C-123 veterans were exposed to would have been solidified, which wouldn't lead to "adverse long-term health effects." And that's because dried Agent Orange does not "readily penetrate into human skin," meaning it would be difficult for C-123 veterans to absorb Agent Orange into their systems, according to a separate 1991 study cited by the VA. The VA reviewed that report, and more than a dozen others, throughout 2011 and 2012 and determined that it's unlikely that C-123 veterans were exposed to Agent Orange, and if they were, it was at levels small enough that it wouldn't impact their health. But there's also a swath of scientific evidence that disagrees with the VA. Most notably, the Agency for Toxic Substances and Disease Registry, part of the Health and Human Services Department, said in 2013 that it could not "exclude inhalation [or ingestion] exposure to TCDD [commonly referred to as dioxin, a chemical included in Agent Orange] while working on contaminated aircraft." It concluded that "aircrew operating in this, and similar, environments were exposed to TCDD." The military stopped using the C-123 planes in 1982. In the late '90s, Air Force officials at Wright-Patterson Air Force Base in Ohio realized that a number of C-123 planes sold to other countries "may have been contaminated by residual pesticides/herbicides" including Agent Orange, according to a 1997 Air Force Security Assistance Center memo. The memo notes that Air Force Security Assistance Center headquarters staff become aware of the problem after the General Services Administration tried to sell some of the planes in Arizona. One of the planes was determined to be contaminated, and so the Air Force presumed that—unless they had evidence to suggest otherwise—all of the C-123 planes were contaminated. A bipartisan group of lawmakers, led by Republican Sen. Richard Burr and Democratic Sen. Jeff Merkley, have pressed for the VA to recognize C-123 veterans exposure. But their efforts are largely on hold as Congress grapples with the larger department scandal, and a government agency studies the Agent Orange claims. The deciding factor could come later this month. The Institute of Medicine is expected to release a report determining if there is "an excess risk of adverse health" for the C-123 crew members. But if the institute says that the C-123 crews were exposed to harmful levels, it could create more headaches for the VA.
Bandzul said that Alison Hickey, the VA under secretary for benefits, has promised to follow the findings of the institute's report. But the roughly 2,000 members of the C-123 crews are a small fraction of the more than 22 million total in the veterans community. And granting benefits to the post-Vietnam veterans could give new life to ongoing fights over Agent Orange exposure between the VA and Vietnam veterans who served at sea, also known as blue-water veterans, or those who served on bases where the chemical was stored. "You could smell the stuff in the air, every time that they fueled a plane. It was unbelievable," Bandzul said. "... So we're wondering if that group [who served on bases where it was stored] is going to be next." In the meantime, Carter hopes the Institute of Medicine will be fair, but is hesitant to believe that things will improve. "We feel that the deck had been stacked against us," he said. "VA took an adversarial position instead of a neutral position against us"
But Carter argues that if he was able to change his mind on the harms of Agent Orange exposure, the VA should, too. He said he didn't believe exposure was harmful until his father, a Vietnam War veteran who was exposed to Agent Orange, died from prostate cancer. "The VA even said, 'You have a family history of prostate cancer,' " Carter said. "No, we have a history of being warriors, there's a difference." This article appears in the October 8, 2014 edition of NJ Daily.